The House Intelligence Committee has finished its interviews and research in the Russia investigation and will begin working on its final report soon. A GOP draft report says there was no evidence that Russian President Vladimir Putin tried to help President Donald Trump win the 2016 election. 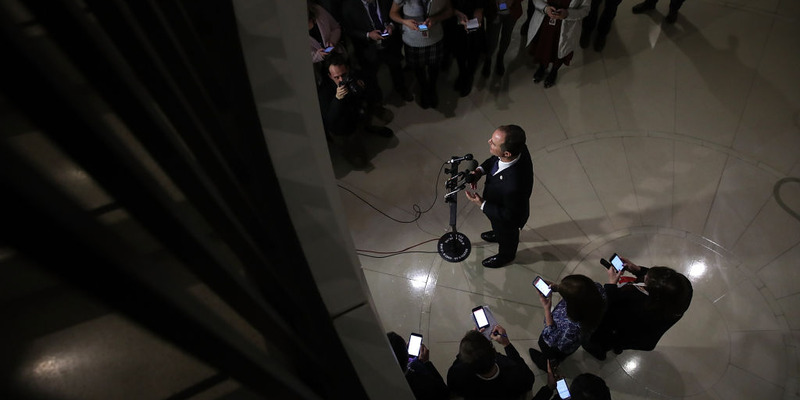 The committee has been mired in political gridlock amid a controversy that saw Democrats and Republicans release competing memos on the conduct of the FBI and Justice Department. CNN reports that the partisanship most likely runs so deep that the committee will release competing reports on its conclusions as well. The House Intelligence Committee has finished all its interviews in its Russia investigation, and Republican members have drafted a report saying they found no evidence of collusion. The 150-page report, which has not been seen by the committee’s Democrats, acknowledges evidence of Russian cyberattacks on US political institutions in 2015 and 2016 and says “problematic contacts” occurred between intelligence officials and the media. In response, Trump tweeted that the investigation “found no evidence of collusion or coordination between the Trump Campaign and Russia,” though the full committee has not yet announced its findings. The GOP also deviated from the intelligence community’s assessment last year that Russian President Vladimir Putin preferredTrump over other candidates. Rep. Mike Conaway, a committee member, said the House investigation had found “bad judgment” and “inappropriate meetings” between Russia and members of the Trump campaign, according to The Wall Street Journal, including the infamous Trump Tower meeting between Trump campaign officials and a Kremlin-linked lawyer. But even the GOP committee members seem to be divided on the draft report. Rep. Tom Rooney told CNN the investigation had “gone completely off the rails” and “lost all credibility.” He also said he believed Russia favoured Trump over Clinton. “I certainly think they didn’t like Hillary,” Rooney said. Schiff also said the committee’s work was far from complete. Win McNamee/Getty ImagesSchiff answering questions following a committee meeting at the US Capitol on February 5. Rep. Devin Nunes, the committee’s chair, announced on Monday that the committee would begin writing its final report. “Once the committee’s final report is issued, we hope our findings and recommendations will be useful for improving security and integrity for the 2018 midterm elections,” Nunes said in a statement. According to The Journal, the committee has interviewed more than 50 people and reviewed thousands of pages of documents as part of its investigation. Signs of its conclusion come amid continuing partisan divisions on the committee. Though the committee interviewed prominent people in Trump’s circle, like the former campaign manager Corey Lewandowski, the former White House chief strategist Steve Bannon, and the White House senior adviser Jared Kushner, it was unable to secure an interview with the president. Several witnesses including Bannon and the White House communications director Hope Hicks curtailed their testimony and refused to answer questions about their time in Trump’s White House. But the investigation has frequently been overshadowed in recent months by the committee’s partisan infighting. Nunes, a Republican, released a memo that accused the FBI and the Justice Department of misconduct in regard to obtaining a FISA surveillance warrant to surveil the communications of a former Trump associate. Schiff, the committee’s ranking member, released a competing memo that disputed the first memo’s conclusions. The committee’s two wings have since become so intractable that CNN reported the committee was likely to produce two separate final reports – one from the Republicans denying that any collusion took place and another from Democrats arguing that some form of collusion may have occurred. CNN reported that the Democratic report may also seek to point out shortcomings in the investigation. Either way, the Russia-related investigation led by the special counsel Robert Mueller is likely continue for at least several more months, as Mueller finishes the obstruction-of-justice portion of his inquiry and moves to finish other parts. That includes looking into whether Trump associates colluded with Russia and any possible role his business dealings played in the campaign. The Senate Intelligence Committee is also investigating Russian election meddling.